Valentine’s Day. Chocolate hearts. (hopefully) No broken hearts. It's the time of the year that some people adore, and some people dread. But one thing most of us can agree on: chocolate is damn good. Unfortunately chocolate does not grow on trees, at least not in a form we would be comfortable eating, so it must be harvested and processed to gain its gooey goodness. This process, sometimes referred to as food manufacturing, dates back to prehistoric times that includes fermenting, sun drying, preserving with salt, and other methods of cooking. Primary processing involves the most basic form of agricultural products which includes farms growing crops or raising livestock necessary in supporting human life. Primary processing eventually transforms these basic building blocks of our meals into something that can be consumed, whether directly (apples or bananas) or after cooking (chicken). Cocoa beans, the primary ingredient in high-quality chocolates, require processing before they can be enjoyed as a tasty treat, which goes through both primary and secondary processing. Secondary processing is the next vital step in preparing foods to be in a ready-to-eat form. This process takes the prepared food items and transforms them into ingredients that you can use to make your dinner. Baking a cake, fermenting grapes to make wine, and grinding meats into sausage are all examples of secondary food processing. Tertiary processing is commonly grouped into secondary processing, which includes the production of processed foods, including candy bars, brownie mixes, and instant noodles. Making the perfect chocolate requires a number of complex steps, but results in one of the most universally loved sweets. From processing to molding, chocolate goes through a multi-day process to transform from a bitter pod to a melt-in-your-mouth treat. As we mentioned earlier, chocolate is not grown on trees, but the cocoa beans that eventually transform into chocolatey treats are in fact grown on trees. Once the pods are ripe, they are harvested and the actual cocoa bean is separated from the pod. Next, the beans are fermented for as long as six days, which can remove more than 50% of the bean by weight. After fermentation the beans are dried, which requires tight controls around humidity and temperature. Without proper environmental controls in place, the beans can develop mold and become unsafe to eat. Once the cocoa beans are dried, they can then be stored for years, giving plenty of time for the beans to move on to the next step in the process. 70% of the world’s cocoa beans are grown in Ivory Coast, Ghana, Nigeria and Cameroon. After processing has been completed and the cocoa beans are dry, they are ready to be roasted. Roasting the beans further brings out the flavor characteristics of the cacao, in addition to removing any left-over moisture that may be trapped inside. This turns the beans a dark brown color, similar to what we associate with a normal chocolate bar. Once the beans are fully roasted, they can be “winnowed” to remove any excess shells and debris from the bean. Winnowing involves high-pressure air and is an essential process for cocoa beans and grains alike. Roasting and winnowing remove everything except the cocoa nibs, the key ingredient in chocolate. The nibs are now ready to be ground. There are a number of grinding methods, some more industrial than others, but each method eventually transforms the nibs into a paste called “chocolate liquor.” This non-alcoholic liquor can then be used directly in the production of chocolate bars, or be further processed to separate the cocoa butter. The butter is normally used in making chocolate bars, with the “presscake” (the remaining chocolate nibs after the butter has been extracted) being used for cocoa powder. Taza Chocolate based in Somerville, MA uses hand-carved stones to grind their cocoa beans. The next step in the chocolate making process is referred to as “conching,” which is simply mixing and aerating the nibs at high temperatures. The conching process includes other ingredients inside a chocolate bar, such as additional sugar. This helps to reduce the acidity of the chocolate, and helps to blend the flavors into a smooth texture. This process has traditionally taken several hours to a few days, but some chocolatiers have used soy lecithin (to the dismay of purists) to speed up the process. One of the final steps in making the perfect chocolate is tempering: the process of rapidly cooling and reheating the conched chocolate to ensure proper crystallization. This process is done before additional ingredients are added, such as almonds, orange zest, or coconut flakes. This chocolate is ready to be enjoyed, but is not in a form that would be easy to sell. Some folks (including myself) would be happy to eat chocolate by the handful, but most consumers prefer to purchase chocolate in a bar form. Molding the blend marks the final step in the chocolate making process, bringing our journey to an oh-so-good, ooey-gooey finale. Chocolate being poured into a mold to then be sold to the general public. The chocolate making process requires diligence and care, and can be done entirely using hand tools similar to traditional methods, or using more advanced technologically driven processes. 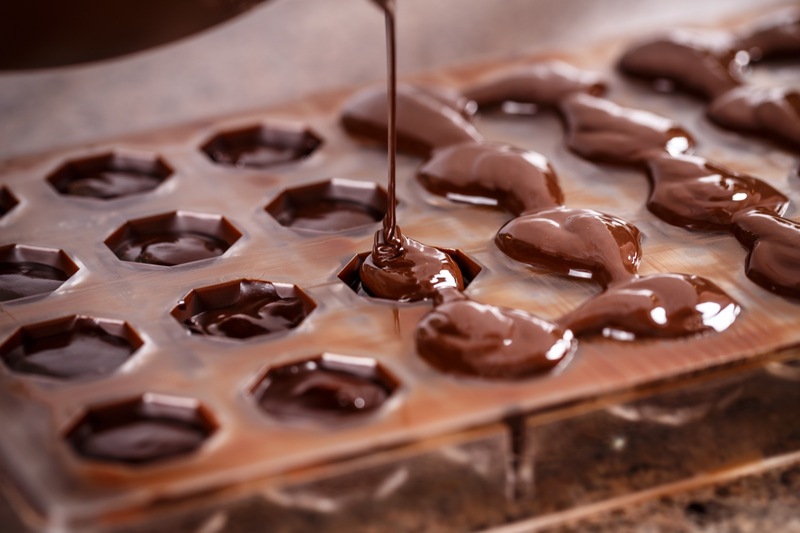 Either way, temperature and humidity play a key role in many steps of the chocolate making process, highlighting the importance of temperature and humidity management. Without proper humidity and temperature controls throughout, chocolate would lose its splendor, and that's simply not an outcome I am willing to have. Subscribe to our blog to get regular email updates on food safety, healthcare safety, and transportation insights.